Paul’s work as an international research scientist in the field of immunology has naturally included an interest in the history of the scientific field. 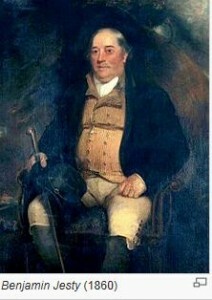 He used the stories of diseases and treatments to illustrate the evolution of the science e.g Dr Benjamin Jesty , a farmer from Worth Matravers in Dorset who famously secretly inoculated his own family with cow pox as a preventative measure against smallpox well before a vaccine being made by Dr Edward Jenner. The notion that those people infected with cowpox, a relatively mild disease, were subsequently protected against smallpox was not an uncommon observation with country folk in the late 18th century, but Jesty was one of the first to intentionally administer the less virulent virus.